Beautiful vintage inspired details are united with a classic modern design to create this remarkable wedding set. The engagement ring sits flush against the eternity style wedding band allowing the eternity band to be worn by itself. This is a style that can worn for a lifetime and blend into ever changing trends. The center holds one round brilliant cut diamond that has a weight of .43 carat total weight. this diamond has a color grade of H-I and a clarity grade of I(1). Accenting the bridal set are 49 round brilliant cut diamonds in the engagement ring and 47 round brilliant cut diamonds in the wedding band. These 96 diamonds have a weight of approximately .50 carat total weight. These diamonds have an average color grade of G-H and an average clarity grade of SI(1-2). Made by designer Beverly K. this bridal set is made in 18 karat white gold and is currently a size 6.5. 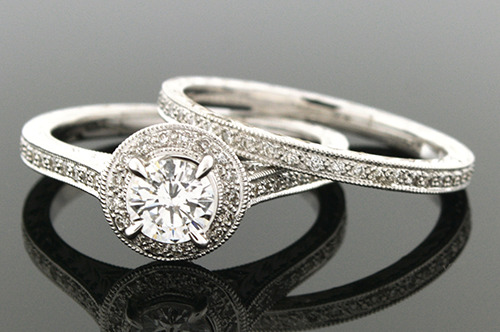 The engagement ring is easily sized and alternative sizes will be made for the eternity band.